Previously, "Tấm" rice is known as the food for "poor people" because it is made from broken rice with the price is dirt-cheap.The origin of the dish is unobstrusive, but nowadays,"Tấm" rice really becomes popular in Vietnam. 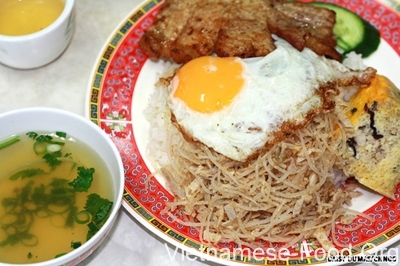 According to CNN.Go which describes the "Tấm" rice often is accompany with omelet, skin of pork and a pieces of grilled pork chop is put on the surface.This dish is served with sweet and sour sauce. 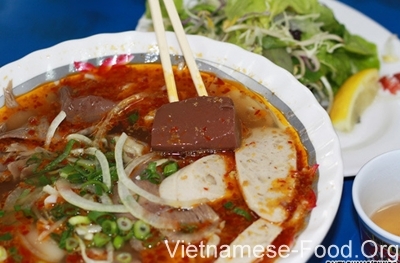 CNN.GO introduced a popular dish in Vietnam for international friends is Hue beef noodle soup. A beef noodle bowl is warm taste because of the scent of lemon grass,chilli, greasy meat, pork pies, oil cooking and blood of pig.All of them are mixed together to have red mixture. Steamed rolled rice pancakes are also ranked in the list of delicious dishes for tourists. Rice flour rolls stuffed with ground pork, prawns, and wood ear mushroom. 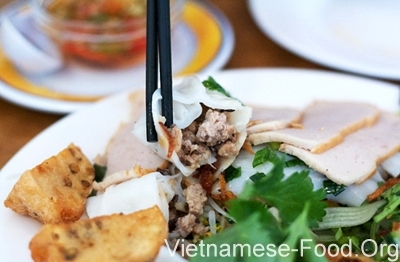 They are eaten in a variety of ways with many side dishes, including one out of many kinds of chả (sausage). Two familiar dishes on the street in Vietnam are chicken and cabbage salad, duck eggs also appeared on CNN, seem to contribute to the rich culinary culture of the country shaped S.